Among the difficulties in assessing the news of Egypt is the Cairo-centrism of journalism. A problem plaguing the nation in general, all major newspapers operate from the capital attracting the best talent away from other regions in search of promotions and a better life. Quality of information suffers; many newspapers simply investigate local developments through phone calls. Finding a well-connected regional Egyptian journalist, therefore, is a contact to be treasured. On a recent visit to Upper Egypt Arab West Report met Mamduh Sarur, who appears to fit the bill. Sarur confirms the existence of organized, trained groups of young men connected to the Islamist movements, especially al-Jama’ah al-Islamiya. In the opposition media these are often labeled ‘militias’, which Islamist consistently deny having. Al-Jama’ah al-Islamiya prefers to call them ‘popular committees’ using the terminology applied to each neighborhood in Egypt when they self-organized after the police vanished from the streets on January 28, 2011, during the revolution. With his own eyes Sarur states to have seen these groups brandishing swords as they paraded through the streets. 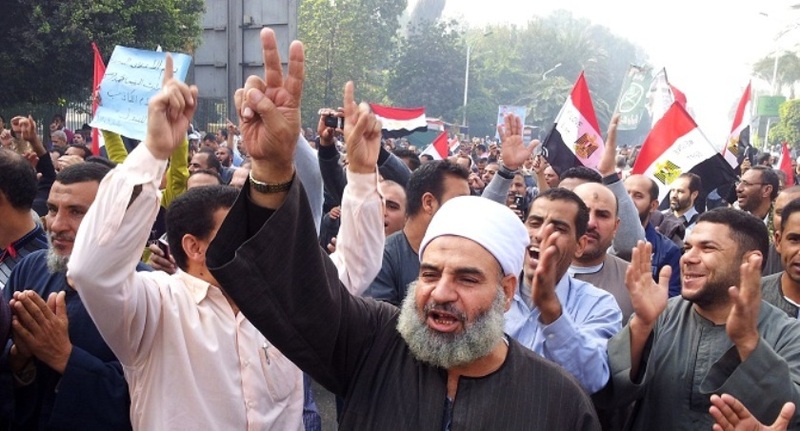 But he insists the Islamist leadership is practical and often floats test balloons before enacting their agenda. This is one of them, and reflects coordination between different Islamist organs. The talk of coordination between Islamist groups, therefore, requires nuance to see the divisions within that are either exploited by the Brotherhood or else a result of their charade. Al-Jama’ah al-Islamiya, for example, ran against the Brotherhood in alliance with the Nour Party during parliamentary elections. But Sarur asked, who funded al-Jama’ah al-Islamiya’s political arm – the Building and Development Party – in their campaign? Unlike the relatively wealthy Brotherhood, al-Jama’ah al-Islamiya leadership spent their years in prison, and upon release were continually harassed by security. The answer, he stated, was simple: Funding came from Brotherhood sources. The mastermind is Brotherhood deputy guide and chief financier Khairat al-Shater. He plays the Islamist movements like chess pieces, moving different agents about in order to keep his organization above the fray. Hazim Abu Isma’il, for example, ostensibly operated independently as he led efforts to besiege Media Production City in protest of the opposition media. In reality they work closely together, and Abu Isma’il’s father was a Muslim Brotherhood stalwart. Al-Jama’ah al-Islamiya, meanwhile, took the lead in protesting against judges, and in particular the High Constitutional Court. As this activity damaged the reputation of their political arm, Asem Abd al-Majed recently resigned from the Building and Development Party in order to operate ‘independently’ against the counter-revolution. Sarur fully expects him to be appointed by Mursi to some government position in due time. But one of the darker sides of Islamist symbiosis, if not coordination, concerns the economic pressures placed on the Copts. Many of the criminal, thug, and arms dealing elements in Upper Egypt come from the now-settled Bedouins as opposed to the traditional agricultural Egyptians of the Nile, Sarur explained. But al-Jama’ah al-Islamiya has a relationship with them. When a thug comes and illegally appropriates Coptic land, the owner will go to al-Jama’ah al-Islamiya because he knows they can solve the issue – as opposed to going to the police or the courts, which will take forever with uncertain outcome. Al-Jama’ah al-Islamiya takes a percentage of the land or a sum of money for their ‘mediation’, but there is not much else the set upon Copt can do. Thanks for always finding great info, Jayson! This is so helpful for understanding the situation.